the bolt weight is reduced. Although it is not practical to attempt to reduce bolt weight by an excessive amount, it is important to realize that efficient utilization of blowback in a gas-opcratcd gun can be of great advantage in attaining the high bolt velocity necessary for a high rate of fire. However, this advantage can be gained only through precise, timing of unlocking in combination with careful attention to minimizing bolt weight. Having analyzed the factors to be taken into account in determining the time for unlocking, the next point to consider is the timing of the transfer of energy from the gas piston to the bolt. In establishing the timing for this transfer, it is desirable to keep in mind the requirements for cffcctive utilization of the available blowback action. As previously pointed out, it is possible to choose the time of unlocking so that the maximum obtainable impulse is imparted by the residual pressure, this impulse being limited only by the requirement that the bolt movement must not cxcccd a definite distance (0.250 inch in the example) before the residual pressure has reached a safe limit ( 750 pounds per square inch at 0.005 second for the assumed conditions). Now, assuming that the time of unlocking is selected so as to take full advantage of this maximum impulse, it can be seen that permitting the piston to act on the bolt before the safe pressure is reached will impart an additional bolt velocity which will cause the allowable movement to be exceeded while the pressure is still dangerously high. delay further the time of unlocking in order to reduce the blowback impulse. However, this would mean that full advantage is not being taken of the available blowback impulse and the energy thus lost must be obtained from the piston. From the standpoint of energy alone, this is perhaps not of critical importance becausc the gas actuating device can be designed to produce almost any desired amount of energy. Nevertheless, it is important to realize that blowback impulse is, in a manner of speaking, "free of charge", while obtaining additional energy from the piston can be accomplished only by paying the full price in terms of increased difficulty in the design of the entire gas mechanism. From the foregoing, it is apparent that the timing of the piston action should be arranged so that unlocking and initial extraction occur at the correct instant to permit the maximum use of the available blowback action. Then, after a sufficient delay to allow the chamber pressure to fall to the safe operating limit, the piston should start to transfer energy to the bolt. Timing the piston action in this manner will result in the most efficient use of available energy and in the least strain on the operating parts of the gas actuating device. The actual timing of the piston action is controlled by the distance the piston travels in performing its functions. Fig. 3-11 illustrates schematically the basic principles involved in this timing. As soon as the projectile passes the gas port, pressure builds up rapidly in the gas cylinder and drives the piston to the rear. 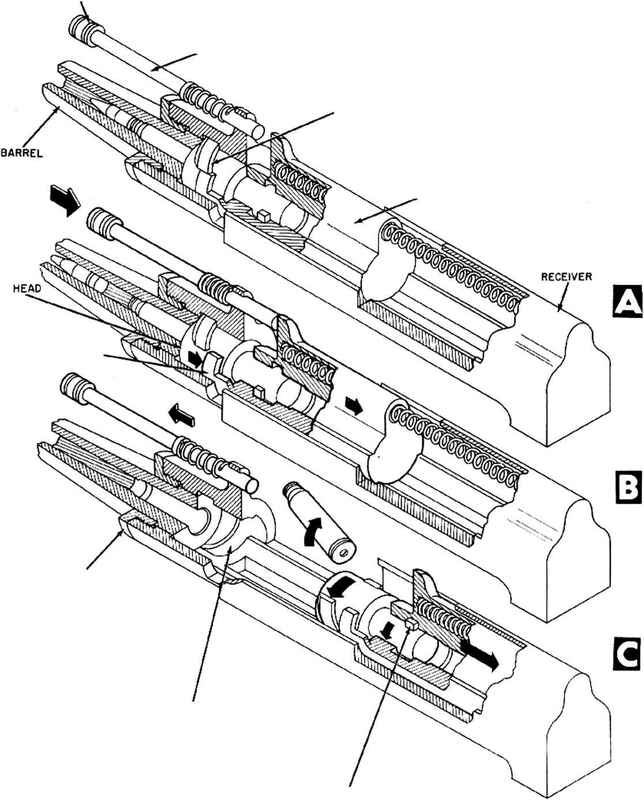 The free piston travel from point A to point B is proportioned so as to allow sufficient time for the projectile to leave the muzzle and for the residual pressure to decrease to the point at which blowback should start. As indicated schematically in the figure, when the piston strikes the locking lever at point B, the bolt is first cammed powerfully back to provide initial extraction and then it is completely unlocked. After unlocking occurs, the free piston travel from point B to point C allows enough time for the blowback action to progress until the residual pressure reaches the safe limit. At this point, the piston strikes the bolt and the resulting impact causes the lx>lt to be driven rapidly to the rear. Since the timing of the entire piston action related to unlocking is based on piston travel, it is evident that anv factor that affects the manner in which the piston velocity varies with respect to time will have a direct effect on the timing. As has been explained previously, the piston velocity is influenced by various factors such as the conditions of barrel pressure, gas port location, orifice size, piston area, piston mass, and others. To obtain correct timing, it is essential for all of these factors to be controlled closely in the design and to be kept constant during the life of the gun by careful maintenance.